Happy Monday, everyone! I hope you had a fantastic weekend. 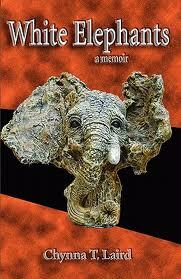 Well, just a short note to invite all of you to join me for my blog tour for my memoir, White Elephants. For those who have read the book, or know about my history, understand why it took me over a year to feel strong enough to actively promote it. Writing the story was hard, going through edit after edit was excrutiating then when the book came out I was happy, yet terrified. Now, I'm ready and strong enough to go out there. How can I not? Anytime I feel nervous or afraid, I think of all the other kids out there going through what I had so many years ago. It's not fair that it's still happening...that kids are still suffering. And that people with mental health issues are still suffering, many in shame or silence because it's still considered 'taboo'. Maybe our story can help open eyes and hearts. I hope so. Click HERE to be taken to the kick off post on WOW-womenonwriting where you'll find the list of dates and locations I'll be over the next few weeks. I'd love it if you could share with anyone you feel could benefit. As well, I'd like to invite you all to join me on my discussion group on Goodreads HERE. I'll answer questions or comments and we can just chat about the book and all other things writing.